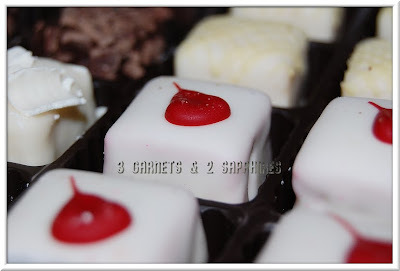 After knowing my husband for 15 years, I just recently discovered that he has a weakness for petit fours. It just goes to show that there is still more to learn about each other, even after ten years of marriage. The petit fours shown below with the red on top have red velvet cake inside, but my favorites are the ones directly behind them. Those have lemon cake inside. YUM!